A spy discovers that the Chinese have created a doomsday device that will destroy the Earth in 72 hours. The crew of an international space mission is hastily rearranged to allow more women. Once they are launched they realize they were all put on board the Astra to repopulate the human race if the Earth is destroyed. All seven of them. Earth does blow-up, leaving the crew no choice to but to try and land on Venus. Because everyone is kind of dumb, things do not go to plan. I’m pretty sure that was my single utterance after watching Doomsday Machine the first time. Probably after several subsequent times as well. 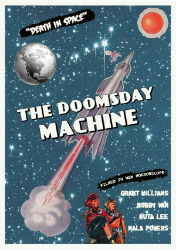 I went in to Doomsday Machine without any knowledge of what it was, aside from knowing it is an SF movie set in space. What actually unfolds never feels like a coherent film, It’s more like a series of almost related events being carried out by actors who may or may not be playing the same characters, albeit with different costumes, and accents. Just as you reach the point of total incoherence, the movie throws in an abrupt downer ending. It may just be the trauma of the experience, but there is something giddy watching this movie disintegrate. I feel like there should be another 'S' in the name of that spaceship. 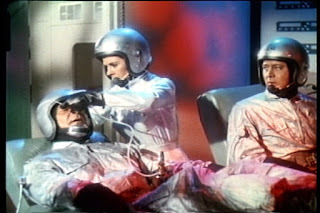 Doomsday Machine begins like a spy thriller, becomes a space movie, morphs into a post-apocalypse drama, and then finally ends in one of the most half-assed attempts at an ambiguous 2001 (1968) style endings ever filmed. I wouldn’t say this film is impossible to review, in fact it’s pretty easy: It’s terrible. That doesn’t stop it from being weirdly compelling. You get the feeling from the first frame that there is something terribly wrong with this movie. Doomsday Machine had a troubled production that began in 1967, but was halted until it was picked up and finished on the cheap in 1972. It shows, since none of the original cast or sets are present in the final act of the film. Instead we are treated to astronauts in totally different spacesuits with dark visors delivering all their dialogue via voice over. 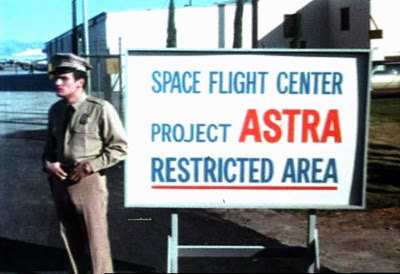 There are continual splices of footage from other films, including Gorath (1962), and the Astra alternates between two or three different models from different films. I can’t imagine this film looking anything but cheap even when it was brand new(ish) in the theaters. Much like Psycho Shark (2009), I can’t recommend this film based any actual qualities the film possesses. I do recommend it as an experience. To watch this film limp to the end and deliver its astoundingly dumb ending, is the kind of journey that can end an interest in film forever or create a trash movie fan. Even a mess like Doomsday Machine can connect on some level. For better or worse, Doomsday Machine exists in the public domain is easily available on cheap DVD sets, archive.org and Youtube for your viewing pleasure. Proceed at your own risk.